There is hardly a public health challenge today that can be resolved without the assistance of legal or policy solutions. Public health professionals at the local, state, and federal levels need to have a clear understanding of our legal system and its role in improving overall population health. The Public Health Law Academy, supported by the Centers for Disease Control and Prevention (CDC), provides a deeper understanding of the use of law and policy to improve population health outcomes. 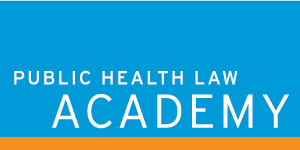 Developed in cooperation with ChangeLab Solutions, the free and easy-to-use online trainings offered by the Public Health Law Academy are essential for all public health professionals. Advance your skills and competencies in public health: explore our trainings! The online trainings can also be used by other professionals, such as public health lawyers, public health nurses, public health educators, public health advocates, and public health faculty and students in graduate and undergraduate university programs. These materials were developed with the support of Cooperative Agreement Number NU380T000141 from the Centers for Disease Control and Prevention. Its contents are solely the responsibility of the authors and do not necessarily represent the official views of the Centers for Disease Control and Prevention or the Department of Health and Human Services.